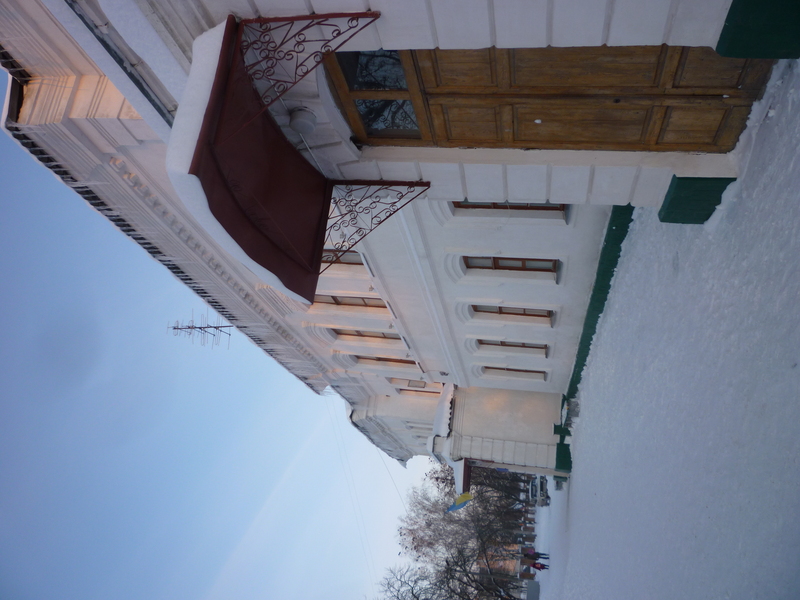 Beautiful Romny sidewalk in front of my school. The tree bottoms are repainted every spring along with the curbs to make the town look fresher. On a more exciting note, I made oatmeal chocolate chip cookies this past weekend and brought them into school to share with my fellow teachers. They were proclaimed очень вкусно (very tasty) by all who tasted them! I am so proud. You might ask, what is the trick to cooking my mother’s famous cookie recipe without half the ingredients and in a soviet era stove? The secret is using a Ukrainian recipe! After successfully burning an entire batch of rock hard cookies made from my mother’s US recipe, I decided to (unplug my incessant fire alarm and) get out the handy dandy “Babushka’s Cookbook”, given to all PCVolunteers in Ukraine and peruse their baking recommendations. I learned that you can make brown sugar by adding a spoon of honey to white sugar, you can indeed buy baking powder in some of the large grocery stores (although Ukrainians think it is extremely unhealthy), and pre-heating my oven to 400 degrees means I should not turn the dial pass the picture of a medium size flame. After learning these helpful hints, my cookies took on a whole new life and were indeed очень вкусно. 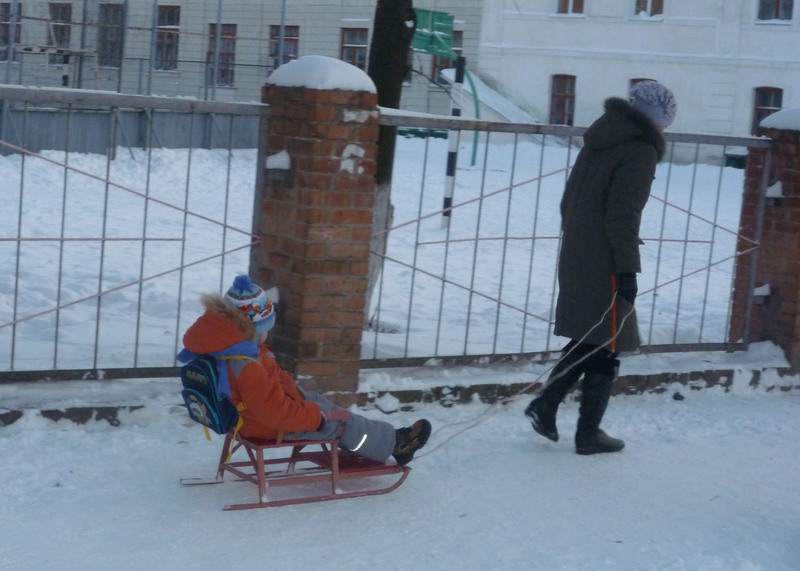 Preferred mode of transport for kids under the age of five during the snowy months. Not an uncommon site. 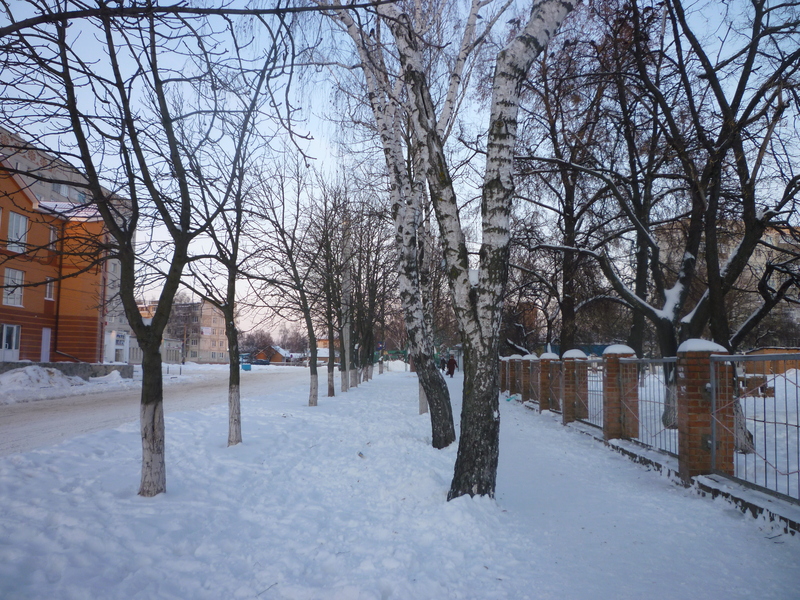 Not much snow, but it is sure cold. Made me shiver just to read this! burrrrrrrrr that’s cold cutie pie. try this one on for warmth while you are preparing the super healthy buckwheat. can’t get this in the states cuz it’s way too healthy for the US pop. Oh, back to the warm thoughts and feelings emenating from Michael Franks ” Blue Pacific” CD. The lyrics make me think about how you found happiness doing and going something like this. Katherine, to fully enjoy the warth you must listening to his smooth voice. Katherine, I live in Slavutich, UA and was wondering what your full recipe is for making your own brown sugar. We have it sent from the U.S. but some of my Ukrainian friends would like to try some of our recipes and I would like to give them this one.